Join a naturalist at the Nature Center for a hike to celebrate Earth Day. 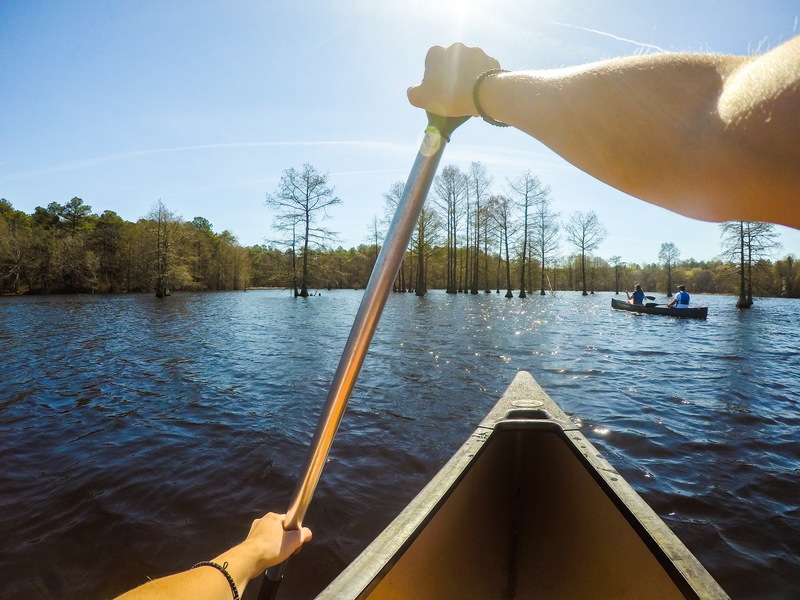 Monday, April 22, 2019 at 4 p.m.
Rowboats, pedal boats, canoes and kayaks can be rented for use within the park during the summer season, and park interpreters host narrated pontoon boat tours on summer weekends and holidays. One of the streams that flows into Trap Pond has been marked as a wilderness canoe trail. A boat launching ramp accommodates small motorized boats for fishing or exploring the pond. Anglers may land a variety of fish, from pickerel, crappie, and bluegills to catfish, American eel and largemouth bass. Fishing license required. Get info about fishing permits. Hiking, biking, and horse trails provide plenty of ways to explore the park. Birdwatchers may spot Bald Eagles, Pileated Woodpeckers, orioles, Wood Ducks, tanagers, and a variety of warblers, depending on the season. Shaded picnic areas overlook the pond, and three pavilions may be reserved for group events. Additional recreation areas include volleyball courts, horseshoe pits, a disc golf course, athletic fields, and a children’s playground. The Baldcypress Nature Center features a variety of displays and programs, and hosts a popular concert series during the summer. Discover the story of the northernmost natural stand of baldcypress trees on the east coast at Trap Pond’s Baldcypress Nature Center. You’ll find programs for park guests of all ages and learn about the history of one of Delaware’s original state parks. 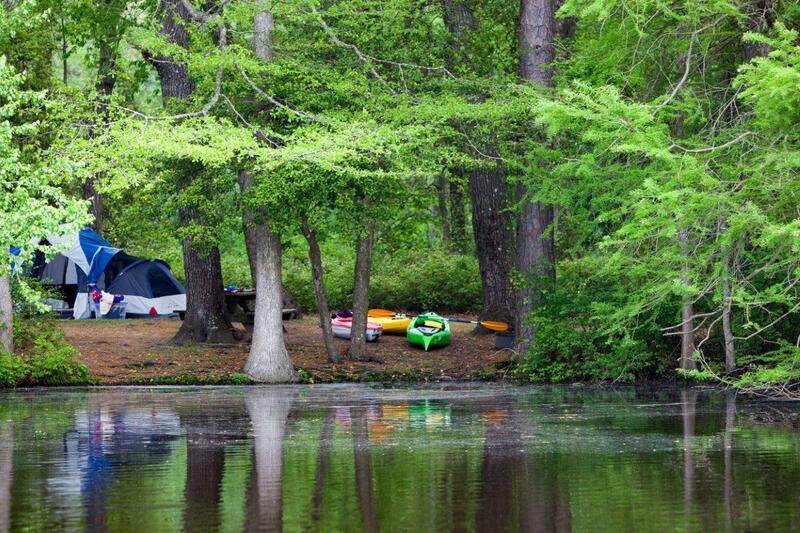 Nanticoke River Nature Preserve – is located along Butler Mill Branch, a tributary of the Nanticoke River. It is comprised of upland forest and Atlantic White Cedar. Amenities: Loop Trail (pedestrian only). Parking along road. Join us for a day of activities and get some ideas for your classroom. Show school ID for free admission to all park programs. Boat tours, wagon rides, and nature programs will be offered. Call the nature center for full list of activities. Come out on our guided pontoon tour and try to spot some of our furry pond residents. We will discuss beavers, otters, muskrats, and other mammals that call Trap Pond home. $6 Adult/ $3 Children 12 and under. Open to ages 15 and under. Proper catch and release methods will be stressed. Prizes will be available in a number of different categories. Bring your own tackle and bait, or borrow ours. These free programs will meet at the boathouse. Registration and instruction begins at 8am, first catch for the tournament is 9. Gather with friends and family at the Baldcypress Nature Center for free live music. Concerts will take place same day, same time, and place each week through August. Don't miss the first one! Sunday through Thursday, 8 a.m. to 4 p.m.
Friday + Saturday, 8 a.m. to 10 p.m.